From the very first moments we witness the green fields and little rivers in the opening of Peter Jackson's The Hobbit: An Unexpected Journey, the audience is returned to the rich and nuanced Middle Earth Jackson created in his vast, triumphant The Lord of the Rings trilogy. The Hobbit fits perfectly into this world, and for obvious reasons: Jackson assembled the same creative team, including effects by WETA, a score by Howard Shore and the same writing team of Fran Walsh, Philippa Boyens and Peter Jackson, with the notable addition of Guillermo del Toro. The cast also all reprise their roles, which enhances the sense of a cohesive world while also leading to moments of unexpected poignancy: when we see Elijah Wood as Frodo, helping his uncle plan his birthday party in the opening scenes, it is the innocent and unscarred Frodo who has yet to carry the ring, entirely fresh-faced and guileless. It can be heartbreaking simply knowing what the characters will later endure. Originally intended as a single film, and then later split into two, An Unexpected Journey is now the first of three movies that will be released over as many years, with the following chapters entitled The Desolation of Smaug and There and Back Again, respectively. While stretching the story of The Hobbit (J.R.R. Tolkien's first foray into Middle Earth and a relatively simple book, often read by children, compared to his later epics) may have been a leery proposition for some who worried the story would be too thin, "like butter scraped across too much bread," there's no hint of "too much film, not enough story" in this first instalment. An Unexpected Journey begins much like The Fellowship of the Ring: with historical context. We see the dwarves of the mountain kingdom of Erebor at the height of their wealth and power, only to have it all stripped away when the dragon Smaug attacks the city, reducing it to ash and taking the dwarves' hoard of gold for its own. The dwarves are forced into a nomadic, meagre lifestyle, while the king's grandson, Thorin Oakenshield (Richard Armitage), swears to reclaim his family's homeland. What is new, however, is the framing narrative: An Unexpected Journey (and the later films to come) make up the book Bilbo Baggins the elder (Ian Holm) is writing throughout The Lord of the Rings trilogy of films. This is Bilbo's story, drawn from his adventures 60 years in the past, and, as such, it is a construction, with a narrative heavier hand than the nimble, in medias res structure of The Lord of the Rings. As Gandalf (Ian McKellan) tells a younger Biblo (portrayed brilliantly by Martin Freeman), "all good stories deserve embellishment," and the brushstrokes of those embellishments are visible on An Unexpected Journey. An Unexpected Journey truly begins when Bilbo starts recounting his tale: how he was minding his own business when Gandalf decided he was the perfect 14th companion for an adventure. A band of 13 dwarves, led by Thorin Oakenshield (the leader but no longer king), seek to reclaim their homeland from the dragon Smaug, who hasn't been seen in more than 60 years. 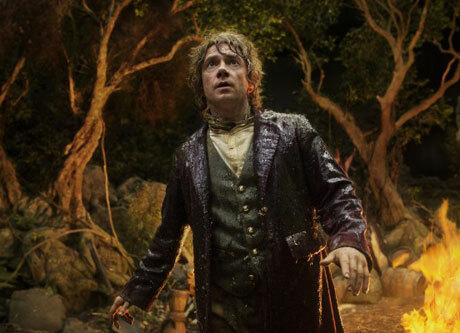 Bilbo (a wild young hobbit who has grown into a homebody) initially refuses, by morning he chases down the company and agrees to join them, though his role (referred to as "burglar") in the company is initially uncertain. By outwitting hungry trolls, battling Wargs and orcs, and ultimately displaying deep resourcefulness, compassion and bravery, Bilbo proves his value. Set atop the core narrative is the larger story of Middle Earth beginning to unfold, as signs and portents pointing to the eventual return of Sauron and the great evil he brings with him are beginning to return in the world, including the Witch King of Angmar rising from the grave and the spectre of the sinister "Necromancer." An Unexpected Journey isn't a perfect film; it begins slowly and then the action sequences start to fall into place, like a game of dominoes that takes ages to set up before racing to its gloriously orchestrated calamity. There are some tonal issues, which are also present in the source text as well, as Tolkien wrote The Hobbit for a younger audience and revisited Middle Earth later through more adult eyes. As such, there are moments of goofiness and physical humour that seem juvenile. The Hobbit also borrows heavily, in terms of structure, from The Fellowship of the Ring, especially in the action sequences: a mounted chase forces the companions to take sanctuary in Rivendell; an underground pursuit along narrow bridges (though wood instead of stone) culminates in a confrontation with a monster and the falling bridges being ridden. For fans of the previous series, the structure of An Unexpected Journey is filled with such moments of déjà vu. Despite these moments of awkwardness, the film is overwhelmingly wonderful. The visuals are absolutely stunning ― filmed at 48 frames-per-second for 3D, the detail and quality of the imagery are so rich it can be challenging to take it all in. The film is so bright that it can almost feel over-lit, at times, as so much detail comes through even in the murk of a rainstorm or the dappled, silvery glow of moonlight. There's no question that An Unexpected Journey is a visual achievement. From the most translucent skin textures to the weighty vastness of the underground dwarf kingdom, there isn't a moment that isn't dazzling. There is less reliance on makeup and prosthetics for actors as well, especially those playing the orcs, who often have their faces replaced with (exquisite) CGI. As with The Lord of the Rings trilogy before it, An Unexpected Journey succeeds greatly by virtue of the exceptional character acting. Gollum is again a triumph; he's a completely believable CGI character, performed by Andy Serkis. The textures and physicality of him are even more absolutely believable. We see Gollum here already ruined by the ring, but not yet devastated as he is in The Lord of the Rings, not separated from the ring for decades or tortured by Sauron's forces. He's wretched, certainly, and mad, but he's happy, until he loses the ring to Frodo. Gandalf is less assured 60 years earlier, more easily cowed by his superiors; Saruman (Christopher Lee) is already plotting, but not so far gone; and Elrond (Hugo Weaving) is positively spry and even a little kickass, personally hunting down some Warg riders. Somehow Jackson and all the actors were able to bring a freshness to the characters, a before-ness and new-ness, as their world was yet to sour. But it's the simple goodness of the titular hobbit, and in Martin Freeman's portrayal of Bilbo Baggins, which is the emotional core of the film. He's not a hero, in the sense of a great fighter or tactician, and is definitely is no leader. What he is, though, is thoughtful, empathetic, creative and loyal. He is willing to throw himself into danger at seemingly hopeless moments, to squeeze through tight spaces; he's resourceful enough to trick trolls with an argument and Gollum with riddles. As Gandalf says in Rivendell, it is the simple things, the small things, the little acts of kindness that save the world. Throughout, Bilbo obviously misses his home; he could easily abandon the journey and return, and the dwarves, who don't initially recognize what he brings to the company, wonder why he doesn't. He has a home, he says, some place he belongs, and the dwarves don't, and so he will help them reclaim theirs, if he can.